We first introduced Glow Hotel in our previous Father’s Day post. It is actually a Thai’s hotel under the management of Zinc with five outlets in Thailand and one offshore, that is, the Penang branch. 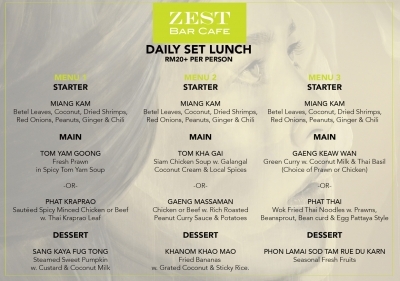 Today, we introduce the new set lunch and ala carte menu, which we found it rather special compared to other Penang hotels. 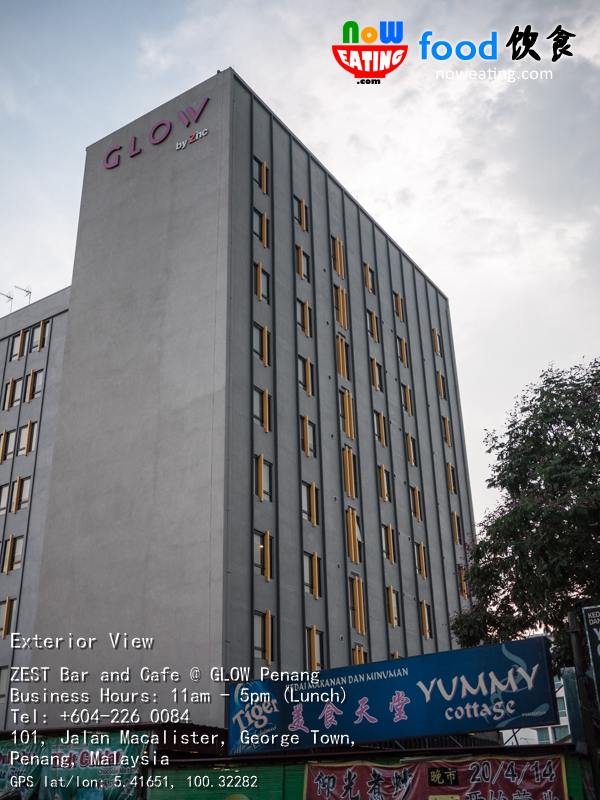 A little update on Glow Penang since our last visit back in Jun-2014. 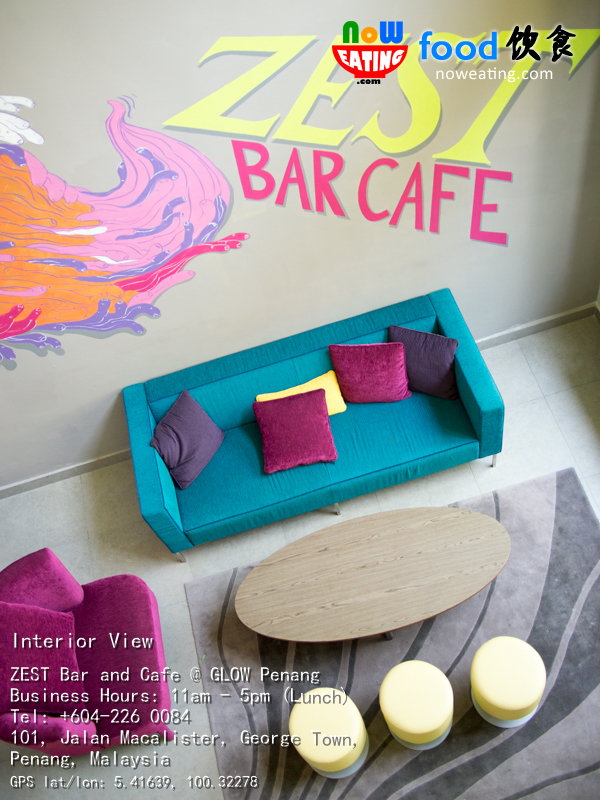 Similar to its siblings, the hotel is becoming more stylish and lovely with colorful furniture and mural arts drawn by local artists – Poodien and Bibi. If it is not the great numbers of Proton and Perodua cars outside the hotel, you almost forget that you are still at Malaysia. 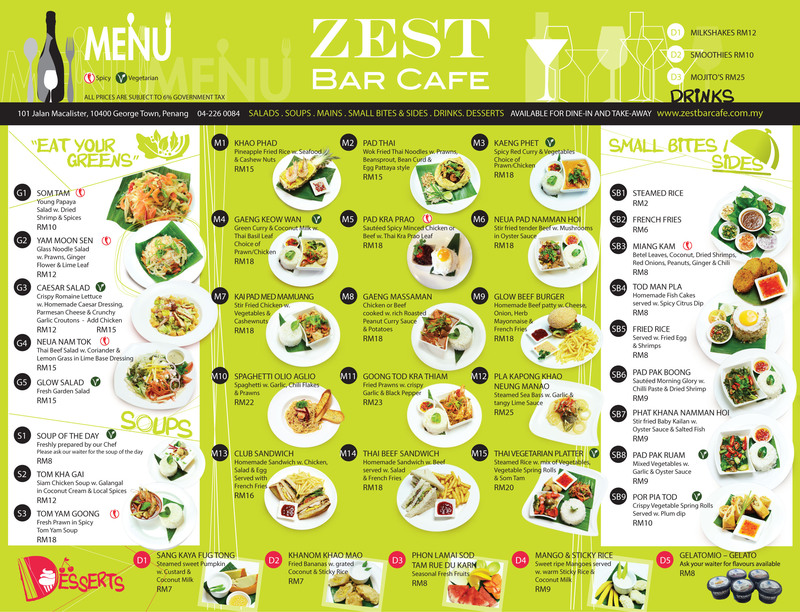 As for the Zest Bar Cafe – the breakfast and lunch place in the hotel, they released new A la carte menu with more than 37 items. This menu is available daily from 11am – 5pm. Hotel guests and outsiders are welcomed to dine in here. 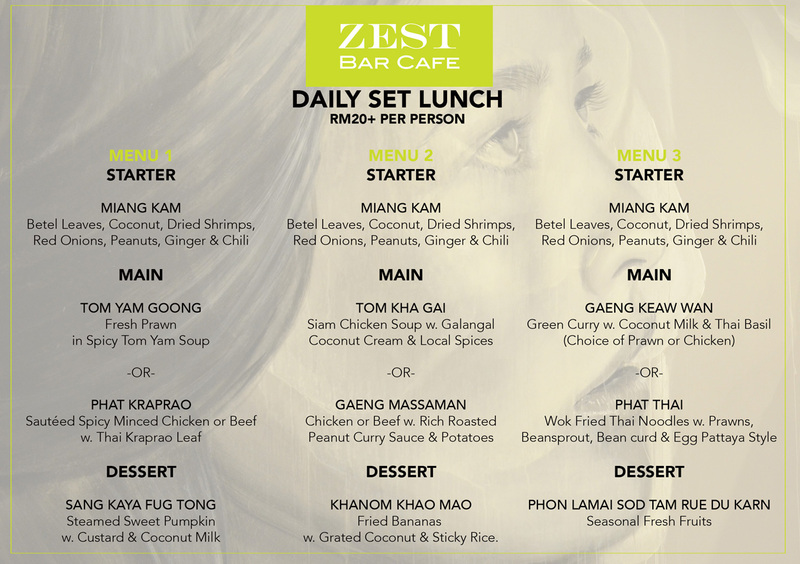 Other than A la carte menu, Daily Set Lunch menu is also available and it comes with three sets with different main course and desserts. Each set is priced at RM20+. Is the set lunch worth the value? The answer is definitely YES. Take a look on its starter – Miang Kam. Similar item in local Thai restaurants is usually priced at RM12 and above. 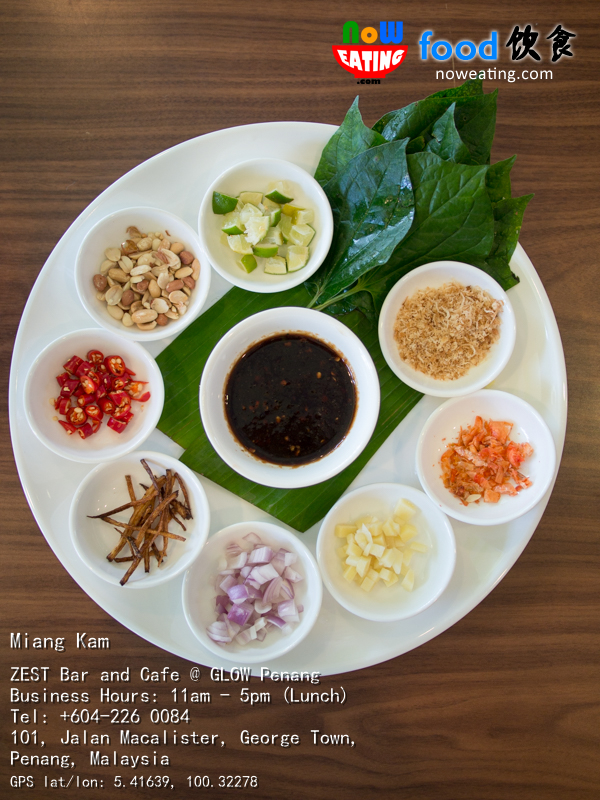 Here, a plate with 10 ingredients including dried shrimp, coconut, Betel leaves, red onions, peanut, ginger and chili is only priced at RM8+. 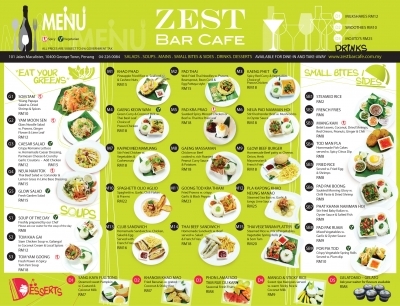 As for the main course, the value is up to RM18+. 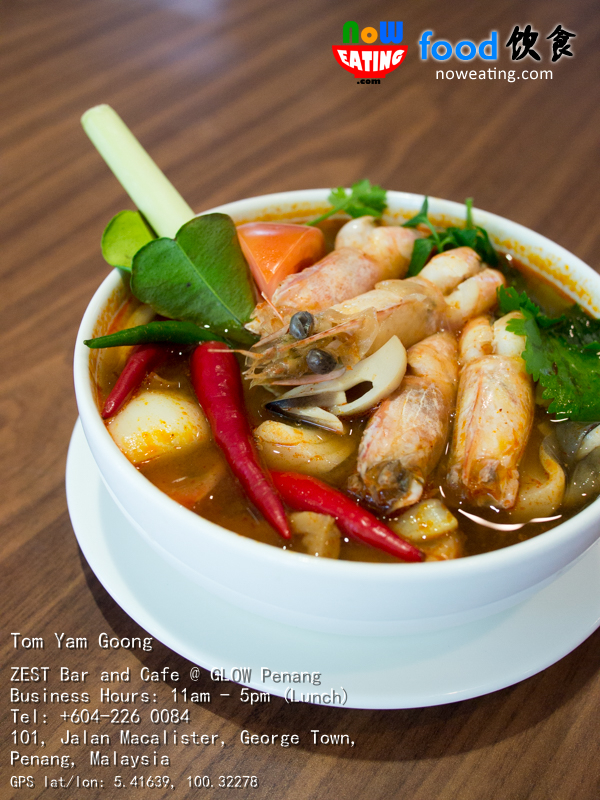 Our favorite is Tom Yam Goong (RM18+) comes with fresh prawns in spicy Tom Yam soup and a bowl of rice. 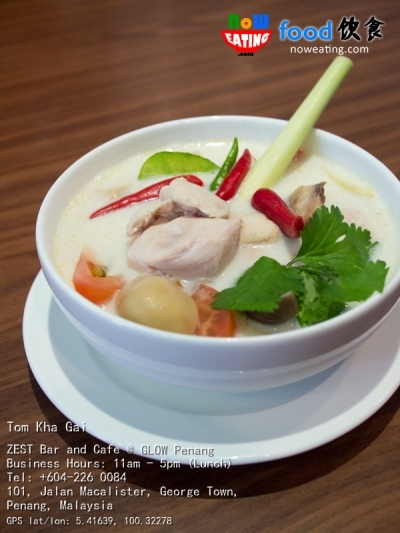 An item caught our attention was this white “Tom Yam” – Tom Kha Gai (RM12+) – a Siam Chicken Soup with galangal 南姜 in coconut cream and local spices. 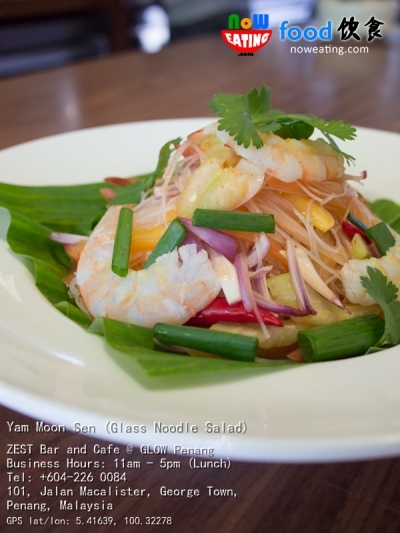 Taste-wise, it is sweet and creamy with mild spiciness. A rare Thai dish in Penang. This item is part of Set 2. 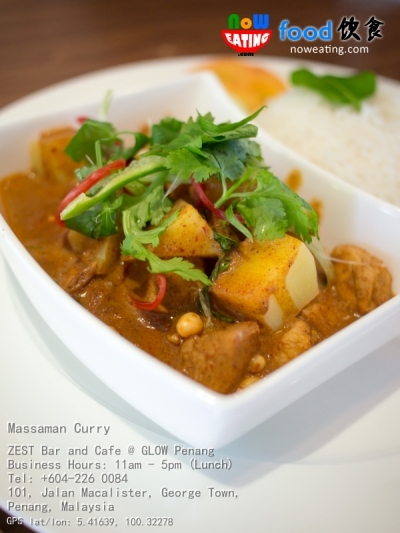 Alternatively for Set 2, you can opt for Gaeng Massaman – chicken or beef with rich roasted peanut curry sauce and potatoes. For Set 3, customers can opt for Green Curry Chicken/Prawn (RM18+) or Phat Thai (RM15+). 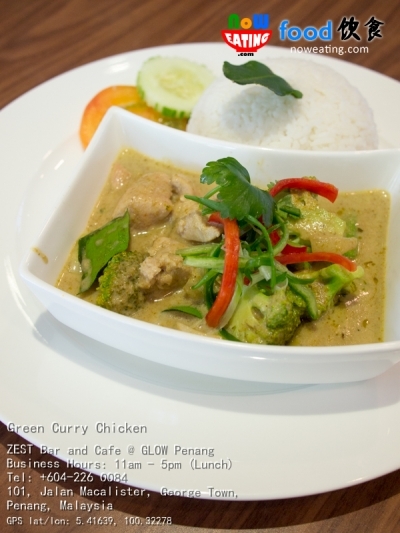 Geen Curry Chicken/Prawn is cooked with coconut milk and Thai basil leaf. 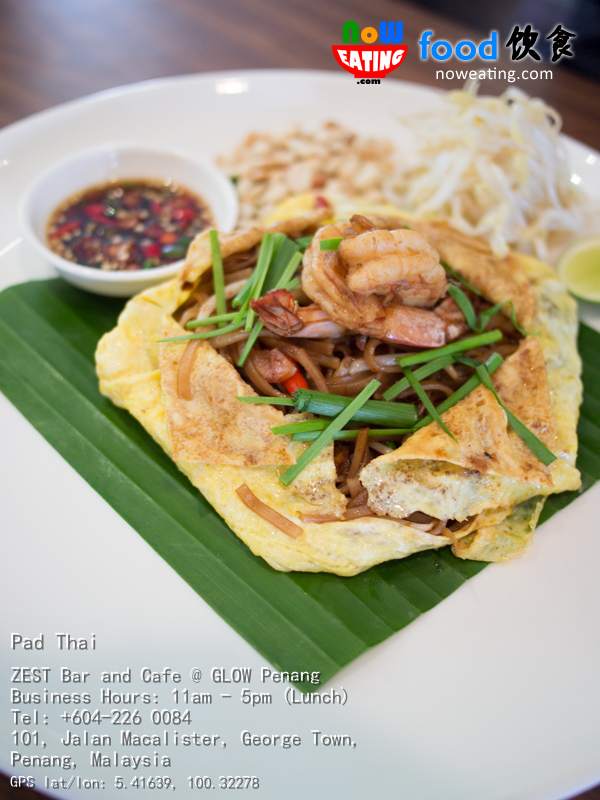 Pad Thai is Thai’s version of Char Koay Teow with wok-fried Thai noodle, prawns, bean sprout, bean curd, and Egg Pattaya style. As for the desserts, each set has its own dessert. Set 1 comes with Sang Kaya Fug Tong (Steamed Pumpkin) (RM7+), which turned out to be our personal favorite. Set 2 comes with Fried Banana with Sticky Rice (RM7+). 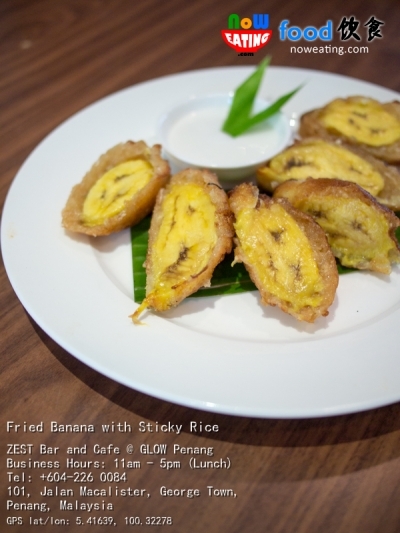 Note that it is not our local Goreng Pisang but is fried with a thin layer of glutinous rice and come with a coconut milk dipping sauce. 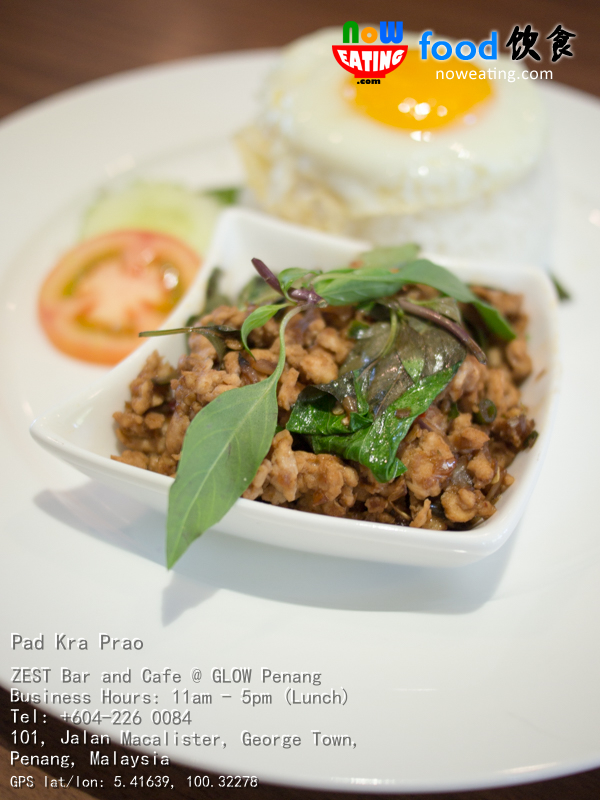 Figure: Pad Kra Prao – sauteed spicy minced chicken/beef with Thai Kra Prao Leaf. As a whole, Zest Bar Cafe provides authentic Thai cuisine hardly found in Penang hotels. Instead of boosting spiciness to the max to tantalize your tastebuds, the food in general have mild spiciness with rich taste, just like the real Thailand food. If Thai cuisine is not your type, western food are also available in A la carte menu. Perhaps a minor drawback is long wait time as each item is prepared by the chef on the spot. Glow Penang hotel is located at Macalister Road, George Town, Penang (opposite of Red Rock Hotel). We actually stayed here once. The room is lovely with modern decors similar to modern Thailand hotels. Parking-wise, a private parking lot is available behind the building and is accessible via a narrow alley. Alternatively, park your car at the shoulder of the main road (and remember to scratch the parking coupon).